Located off Old Shakopee Rd. and Normandale Blvd., our Bloomington Montessori academy location is perfectly located for convenience, yet simultaneously provides a beautiful space to enjoy nature and privacy. Our Bloomington location serves families from the south metro area including Savage, Burnsville, Bloomington, Eden Prairie, Shakopee, Edina, Richfield, and Hopkins. Newly remodeled over the summer of 2018, the indoor environment at our Bloomington Montessori school consists of two Children’s Houses preschool programs and two Toddler rooms. Toddlers have a different set of developmental needs from preschoolers, and we are passionate about providing them with an early educational environment that is specifically designed to ensure their needs are met. We provide a learning environment that provides the structure that toddlers need, but it is also one that is fun and flexible to accommodate our incredible learners. Much of our curriculum incorporates singing and physical movement in order to provide an atmosphere that is supportive, positive, and non-competitive. All of the purposefully prepared environments are physically and psychologically designed for the children to move freely, choosing work that interests them and meets their developmental needs. 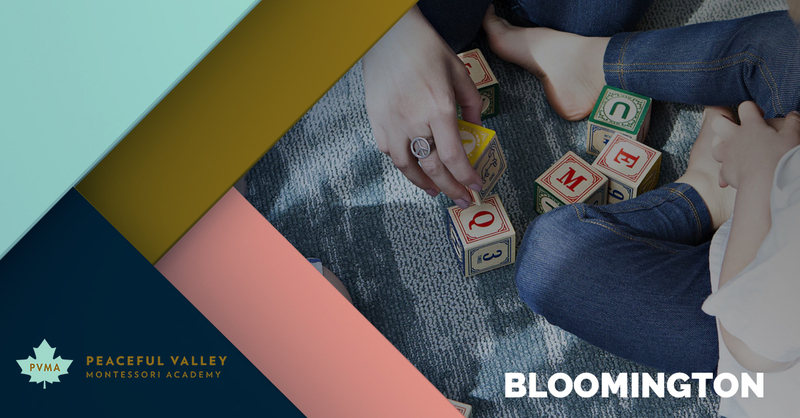 Our Bloomington Montessori school has two separate outdoor play areas, one for Children’s House and one for Toddlers, complete with age-appropriate outdoor activities, nature-based toys, sandboxes, and playgrounds. In addition to these peaceful outdoor areas, our Bloomington preschool and child care facility is our only location to have a large greenhouse for exploring lifecycles and nature year round, a true treat in a state that experiences such a long winter! This allows our children to plant, care for, and harvest vegetables throughout the entire year, an activity that provides each child an opportunity to further understand the beauty of nature during their formative years at Peaceful Valley Montessori Academy. Ready to learn more about our Bloomington Montessori school? Contact us today at 952-388-3627, or apply and enroll online now!